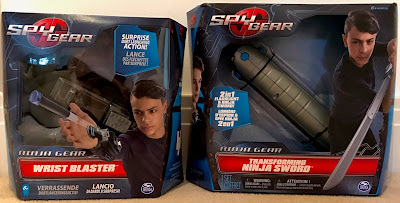 Ben and his friends love playing ninjas and pretending to be spies so when I heard about the Spy Gear Ninja range by Spin Master toys I knew they would be a huge hit. Needless to say there was serious excitement when I showed him the Spy Gear Transforming Ninja Sword and Wrist Blaster which we were sent to review. They are in his words "super awesome!". The Spy Gear Transforming Ninja Sword is a 2-in-1 flashlight and ninja sword which is the perfect toy for little ninjas in training. With a push of a button the hidden sword pops out, just be careful not to hold it too close to your face or you may get a smack like Ben did. We found the sword a little stiff to fold back in the first time but once done a few times it was fine for both Ben (7) and his little brother and sister (3) to do by themselves. The kids all loved the fact that the Ninja Sword has a flashlight, or laser beam as we call it. Again, this is easy to put on with a press of a button and is perfect for night time ninja adventures which my kids love. The Ninja Sword itself is made of plastic and is robust enough to withstand the boisterous play you would expect from active kids, we have certainly put it to the test and it has passed with flying colours. The flashlight is a great feature which, for my kids, elevates it from just a sword to one with powerful super powers, Ben is obsessed with lasers and using them to fight evil so it cleverly let him do just that. The Transforming Sword is suitable for ages 6+ and is available to purchase online from Amazon, currently priced at £16.74 and can also be found at the usual toy retailers such as Smyths Toys. 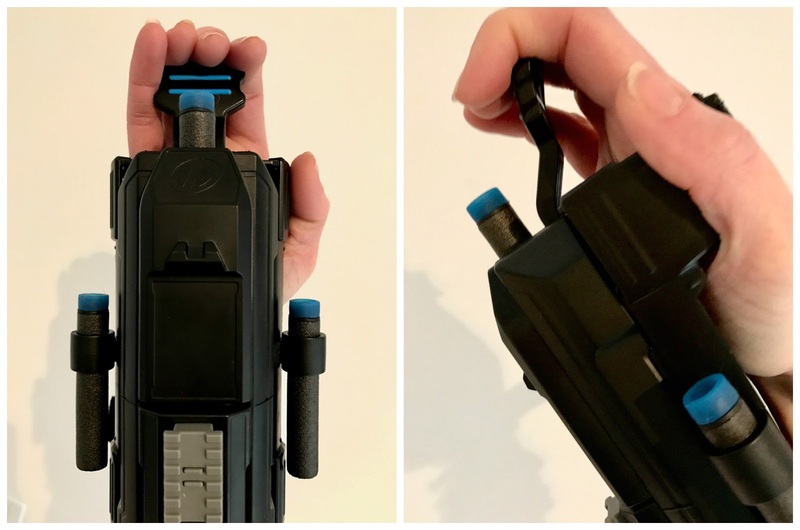 The Spy Gear Wrist Blaster is very cool, it straps onto your hand and wrist and can fit inside your sleeve, as long as your cuff is a wide enough one to fit it. It comes with three super sticky bullets that can be fired discreetly by pressing the lever which is at your fingertips. 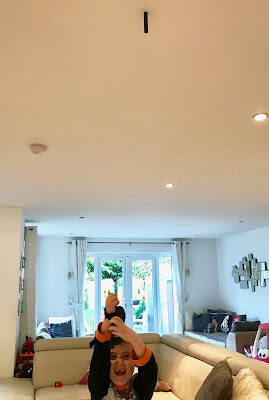 The bullets with their magic sticking power have definitely impressed the kids and kept Daddy busy as he is the only one tall enough in our family to retrieve them from the ceiling. 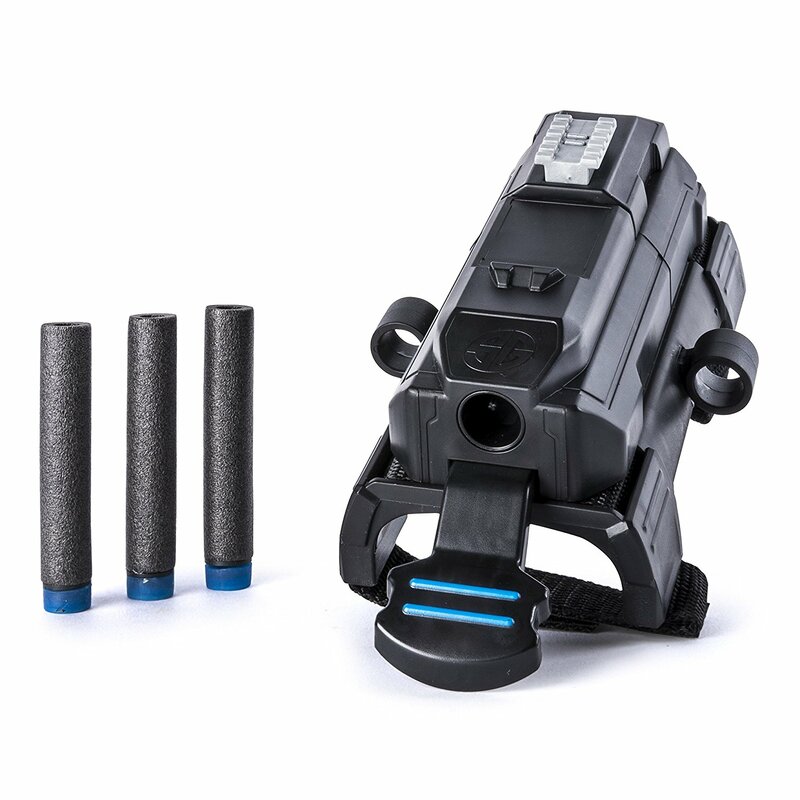 There is also a built-in accessory clip which allows you to attach the Spy Go Action Camera (sold separately) and catch awesome spy mission footage which Ben is busily saving up for. We have had a lot of fun with the Wrist Blaster, the "sticky" bullets are brilliant as they literally stick anywhere. We have set up targets and had shooting practice and the twins and I are perfecting our ninja bullet dodging moves when Ben comes on the attack. Like the Ninja Sword, the Wrist Blaster is well made to withstand the rough play of little ninjas. The bullets themselves are fantastic and a lot more fun that just foam bullets, you just have to keep them clean of fluff to retain the stickiness which a quick rub of a baby wipe or similar will sort. The Spy Gear Wrist Blaster is aimed at children aged 6+ and is available to purchase online from Amazon currently priced at £14.49. Both the Spy Gear Transforming Ninja Sword and Wrist Blaster get a massive thumbs up from Ben and his friends. From a parent's point of view I have had a lot of fun watching the kids play with these toys, they have definitely added to their Spy and Ninja role play games so I can totally recommend. I have a feeling we may be adding to our Spy Gear Ninja toys soon as there has already been a lot of talk about the possibility of getting the Spy Camera and Ninja Stars. 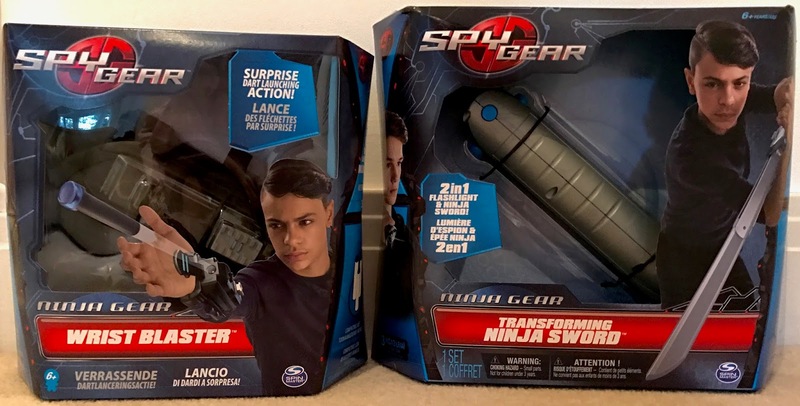 *Disclaimer: I received the Spy Gear Transforming Ninja Sword and Wrist Blaster in exchange for review. All views and opinions are my own and unbiased.